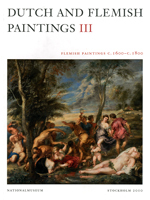 488 pages, Illustrated, 8 1/2 x 11 1/4"
This is the third in a series of catalogues dealing with Dutch and Flemish paintings held in the Nationalmusuem, Stockholm, Sweden. This volume covers paintings from the 17th and 18th century. Many of the works originate from the royal collections and others were acuired through the agency of Sweden's most important art collector. The musuem owns several paintings by Peter Paul Rubens, van Dyck, Brueghel, and many others.